Not only is June Dairy Month, but it is also birthday month, at least at our house. 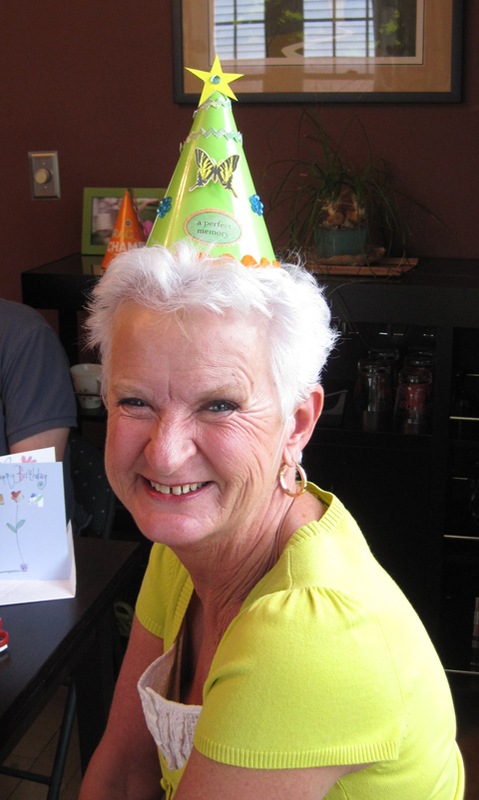 This year we kicked off the festivities by celebrating the 70th birthday of Greg’s mom, Susan. 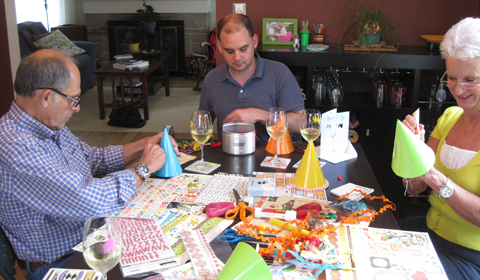 We invited Susan and Warren over to our house for a bit of a party, featuring wine, cupcakes and crafts. If you think that sounds remarkably similar to the birthday party we threw for our three-year-old goddaughter, you would be correct. Except that this one had wine. 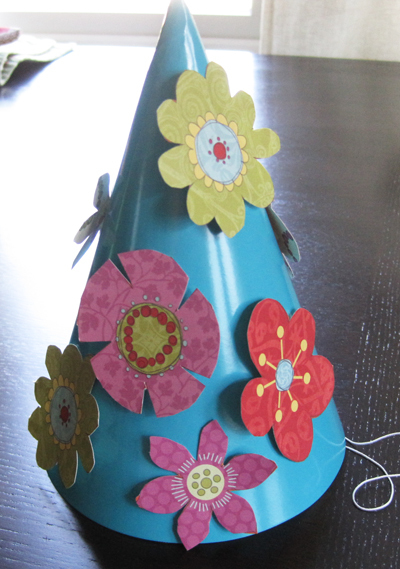 My party hat idea was quite ambitious. 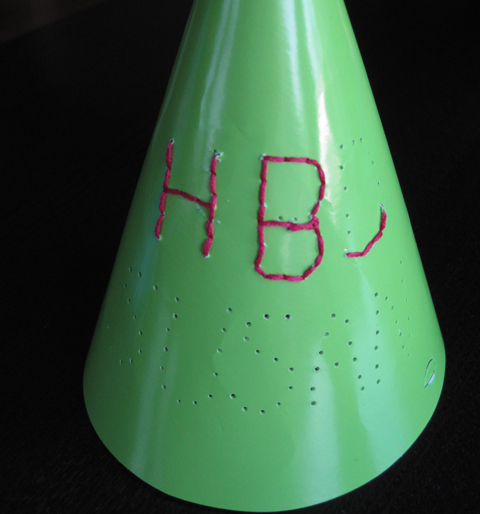 First I poked holes into the hat for form the words HBD Susan. Then I sewed embroidery floss through the holes. Until it became obvious that was going to take a ridiculously long time to finish. Abort! So I quickly fussy cut some flowers and went for a floral explosion instead. 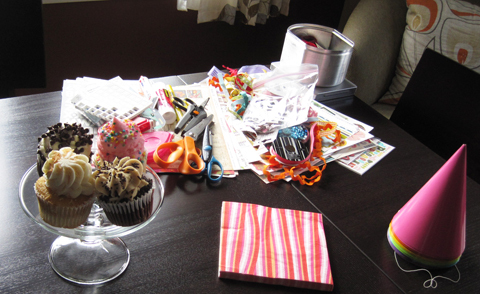 The birthday girl had fun playing with the scrapbooking toys. In case you can’t tell, that butterfly is 3D, thanks to a foam adhesive square. 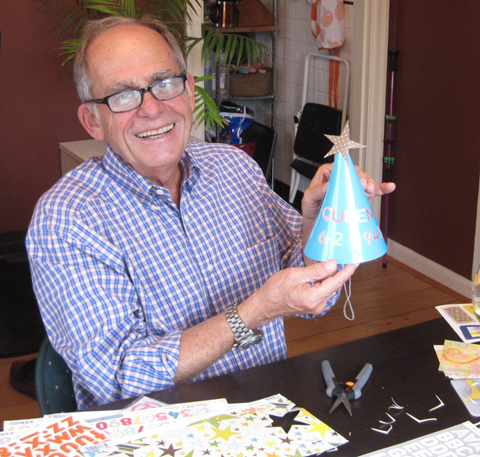 Warren did some fussy cutting, too, in this tribute to the coronation of Queen Elizabeth, which happened to take place on Susan’s 10th birthday. Fun fact: The Queen isn’t a very good pen pal. Susan sent her a letter about that momentous day, and she hasn’t heard a word back in 60 years. Hmph. 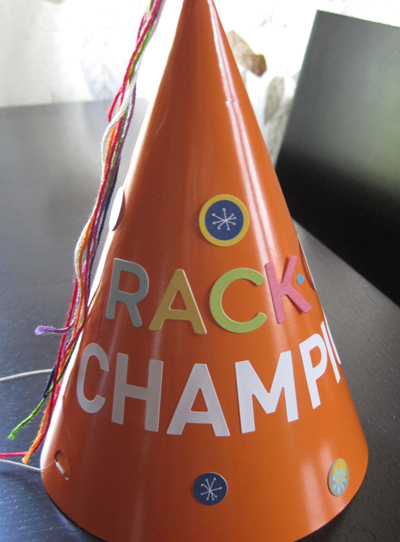 Since one of the things we do when we get together with Warren and Susan is play the game Rack-O, Greg made this Rack-O Champion hat for the winner of each round to wear. Susan wore it twice that day! This shot cuts off the top, but the embroidery floss is coming out of the tip of the hat, like a fez. Two days after that, it was time to celebrate my birthday. It was more of a low-key affair, with donuts in the morning, lunch with a friend, and dinner and ice cream out. But I did receive this wonderful fat quarter medley from my mom. Does she know me, or what? 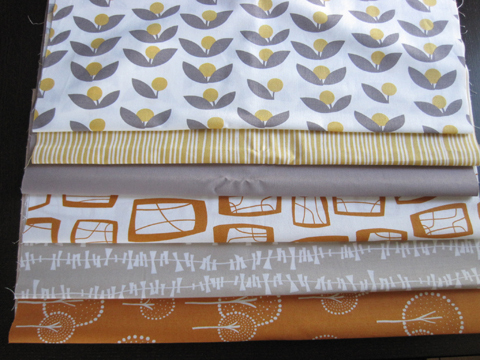 Sewing-wise, I have been working away on the quilt-as-you-go charity quilt. More on that soon (or whenever I get some more thread)!